The front cover is a recipe called, The Best Chocolate-Sour Cream Frosting Ever, located in the (Frostings) section of this book and submitted by Penny Jordan. 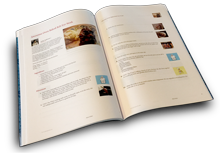 Order a professionally printed, perfect bound cookbook with a full color glossy cover and 48 recipes. Thank you Courtney for the Butter Cream Frosting recipe! I love it and added it in two of my cookbooks! Thanks for including my recipe! Nice book!! Me too Shelia! So happy you like the book! Thanks for downloading this and have a great night! Thank you Wendy for such wonderful recipes!! Those cupcake recipes look amazing!! As Nancy said, love your recipes!! Thank you Kathy, I love frosted anything and found some awesome recipes that I felt were worth gathering in a book. Yours of course being one of them. I have been wanting to do a Hummingbird cake as I have not done one and yours looks so divine with that amazing frosting! Thank you Kathy, can't wait to try it! Congratulations on your new cookbook, it looks like the perfect book to find some great frostings. Thanks for including one of my favorites.